This week I am on a much need vacation and a getaway to San Antonio Texas for the first annual Dear Jane Texas Cowgirl Round up with Brenda Papadakis! Headed off in the morning for 5 days of working on those 4.5 inch blocks and some triangles too. Looking forward to meeting up with fellow Janiacs for food, fun, and lots of sewing! I will be working on the Red White and Blue Dear Jane, started two years ago. 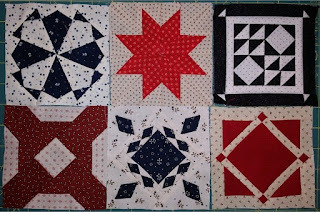 Yes, this quilt takes a bit of work, but I really enjoy the challenge of the paper pieced blocks, and working on my applique skills. Below are the latest finished blocks for this quilt. So far about 50 completed. 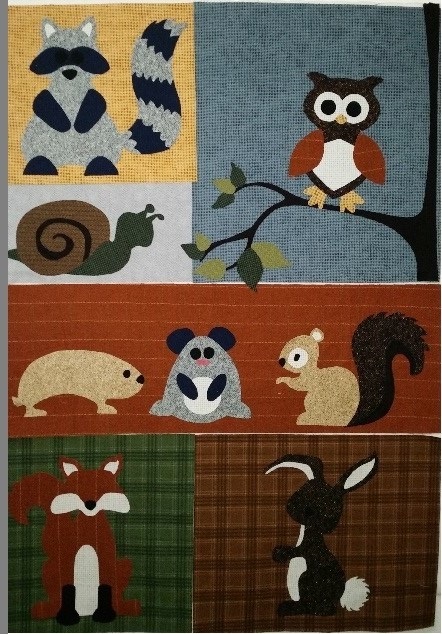 Also on the Design Wall this week is Woodland Wildlife. All the pieces are cut and placed, just need some time to sew them all down. Won't be happening this week, but will get to this as soon as I return. 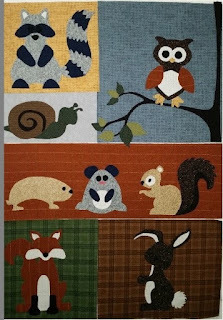 Also, on the Design Wall is the almost completed challenge for Sunshine Quilters, based on the game Clue. I just have to add one more element, then quilt and bind. It is small so should go quickly. Can't show until the reveal at meeting on June 9th. Hope to finish it up as soon as I return from Texas. It has been a busy couple of weeks on My Design Wall.